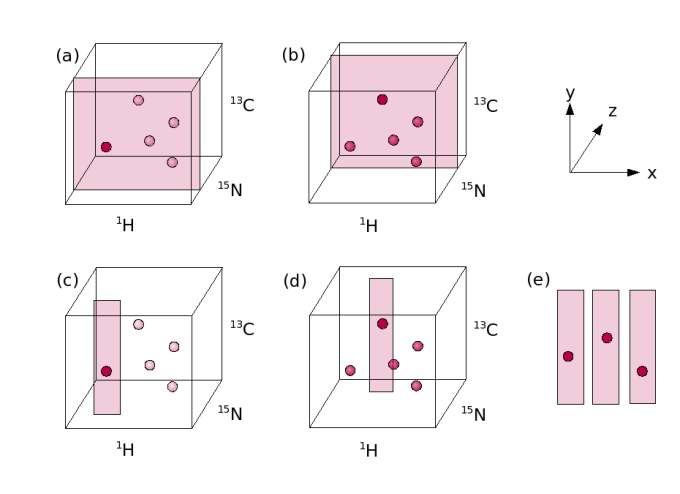 3D experiments are generally based upon 2D experiments and so the easiest way to think of a 3D is of a 2D which is then extended into a third dimension. Take, for instance, an HNCO. It is based upon a 2D HSQC (a), so the x and y axes are 1H and 15N, respectively. This is now extended into a third dimension which is a 13C dimension. 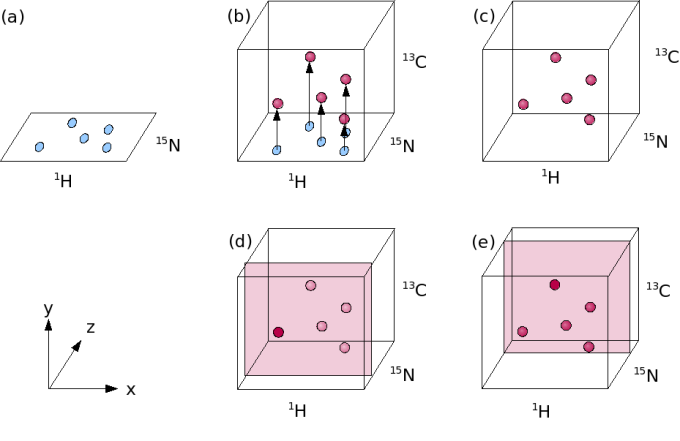 So the HSQC peaks will now not just lie in one plane, but they will be lifted up into the third dimension and lie at the 13C ppm value of the CO group preceeding the NH group (b and c). It is now possible to look at the 3D spectrum from various different angles and each time see a different plane. The 1H dimension is generally left in the x-dimension and in most cases the 13C dimension is viewed along the y-axis, leaving 15N to form the z-plane. So essentially you end up looking at a 1H-13C 2D spectrum at varying places along the 15N dimension (d and e). Most spectra used for triple resonance backbone assignment have a 1H, 15N and 13C dimension each. Several other types of spectra, most notably 3D NOESY spectra and HCCH-TOCSY/COSY spectra have two 1H dimensions and one 15N or 13C dimension. In this case, the two 1H dimensions are viewed in x and y and the 15N or 13C is left in the z-plane. A common way of visualising 3D spectra is as so-called Strips. Consider, for instance, a particular z-plane of a 3D HNCO spectrum (a or b): you will probably end up with only one peak in that z-plane. (Even if there are peaks with a similar 15N ppm value, they will lie just above or just below the actual plane you are currently looking at.) Therefore there is not much point in looking at the complete 1H width of the spectrum and instead you can trim the area you look at to the 1H region just surrounding your peak (c and d). This way you end up with a Strip. It corresponds to a particular 1H and 15N part of the spectrum, but shows the complete 13C width. Thus, if you start with an HSQC where each peak is defined by a 1H and 15N value, you can then pick out strips for each HSQC peak and then lay them next to one another for easy comparison (e). For protein backbone assignment this is particularly useful.